PROVIDENCE — Cooper “Chick” Bacon, who pleaded guilty in federal court to seaman’s manslaughter in the 2015 death of Stonington resident Walter Krupinski, was sentenced to two years of probation and ordered to pay $1,800 in restitution at a hearing in district federal court Thursday. U.S. District Court Judge John J. McConnell, Jr. sentenced Bacon to probation that included additional terms blocking him from operating any marine vessel bigger than 26-feet long, whether personally-owned or as a captain-for-hire. Bacon, 80, was also ordered to pay restitution of $1,800 for removal of the crashed boat, and was banned from having any contact with Krupinski’s family. On Sept. 22, 2015, Bacon was at the helm of a 60-foot luxury yacht, the Princess 60, when it collided with a Krupinski’s 23-foot powerboat, the Peggy K, in Fishers Island sound off the coast of Watch Hill's Napatree Point. 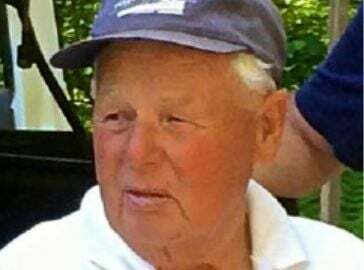 Krupinski, 81, died as a result of multiple blunt force injuries sustained when the 67,241-pound yacht ran up and over the open cockpit of the powerboat. In March 2016, the Rhode Island Department of Environmental Management found Bacon guilty of violating three U.S. Coast Guard navigation rules by his improper navigation or failure to have a lookout, failure to take action to avoid a collision and improper overtaking of another vessel. Each conviction carried a $100 fine. The department also found that Bacon’s negligence in the operation of the yacht led to the crash. At the time of the collision, Bacon had been hired to pilot the yacht from Newport, R.I. to a boat show in Stamford, Conn. According to GPS data collected from the Princess 60, the yacht approached Krupinski’s power at an average speed of 25.2 knots, with auto-navigation engaged at the time of the collision. The yacht was equipped with safety equipment including an operating horn, VHF marine radiotelephone, navigation system, and radar system. According to the RIDEM’s investigation, Bacon failed to take normal precautions including posting his First Mate to look out and making proper use of radar. As a result, he did not see the Peggy K in time to take steps to avoid the collision, such as slackening speed or reversing propulsion, changing course or sounding the horn. Reached by phone Monday, Peggy Krupinski said she had no comment on Bacon's sentence at this time. Seaman’s manslaughter, a felony, is punishable by a maximum punishment of 10 years in prison, three years of supervised release and a fine of up to $250,000.